Some of you maybe familiar with motivational speaker, Nick Vujicic. He has appeared before numerous people around the world, including a guest appearance on the Oprah Show. 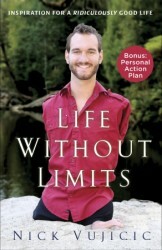 When his book, Life Without Limits, came up for review, I knew that it was one I wanted to read. Life Without Limits is not simply a book about Nick’s life and how he, being born without arms and legs, has overcome immense obstacles. That would have been a good book, but Nick takes the reader a step farther. He challenges the reader to find their life purpose and then go after it despite what difficulties or limitations you may perceive. Nick does a great job of offering practical advice for your journey towards this God-given purpose. Each one of us needs to remember to focus on what we can control and let God take care of the rest. I would definitely recommend this book, talk about gaining a whole new perspective on life. What are you waiting for? Start on your journey to a life without limits.